Atheist Ireland has used the Freedom of Information Act to examine more than 20 years of public records, describing how the Religious Education Curriculum at second level was created and delivered. What we have found is Church and State tightly entwined, in a process that overtly breaches the constitutional rights of parents and children. Documents obtained under Freedom of Information, reveal how this situation was arrived at, with the full knowledge of the constitutional rights that were being breached by both Church and State bodies. As part of the development of the State junior cycle curriculum for Religious Education, the National Council for Curriculum and Assessment (NCCA) formed a Religious Education Course Committee (Post Primary). The inaugural meeting of this Course Committee recognised the legal issues associated with their endeavour, before they even began their work. At the earliest stage of the project, as part of the very first meeting of the Course Committee, the CEO of the NCCA explained the requirement for neutrality. The NCCA then entered into correspondence with Department of Education on these legal issues. 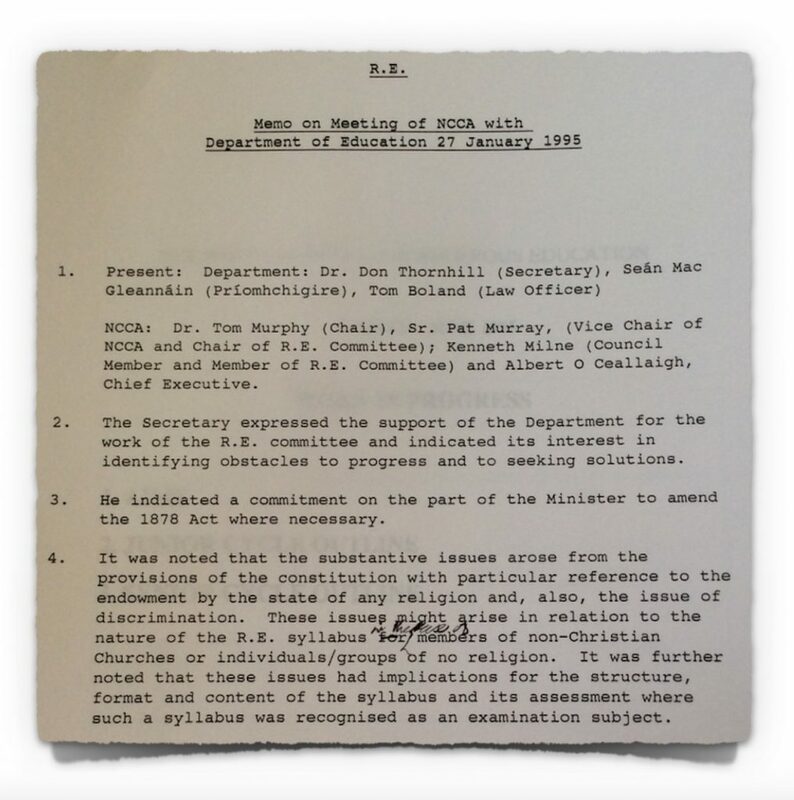 On 10th March 1994, Micheál Ó’Néill, Assistant Secretary of the Department of Education, wrote to the CEO of the NCCA on a number of different legal questions. One point was the constitutional prohibition on discrimination based on religion. That is, if a State-administered Religious Education examination course was bias towards say Catholicism, then this would discriminate against citizens of all other faiths and none. 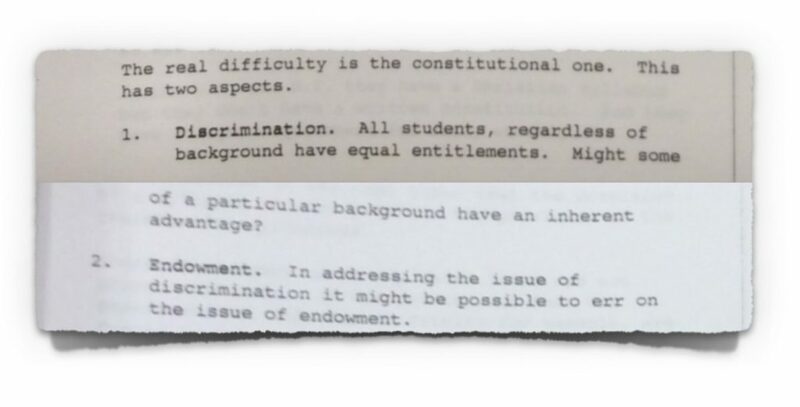 The view of the Department of Education was that the course would be constitutionally required to be educational (as opposed to a course that was involved in faith formation). That is, rather than privileging one religious denomination by teaching that its tenets are true, the course must seek to educate children about various aspects of the phenomenon of religion in a neutral manner. 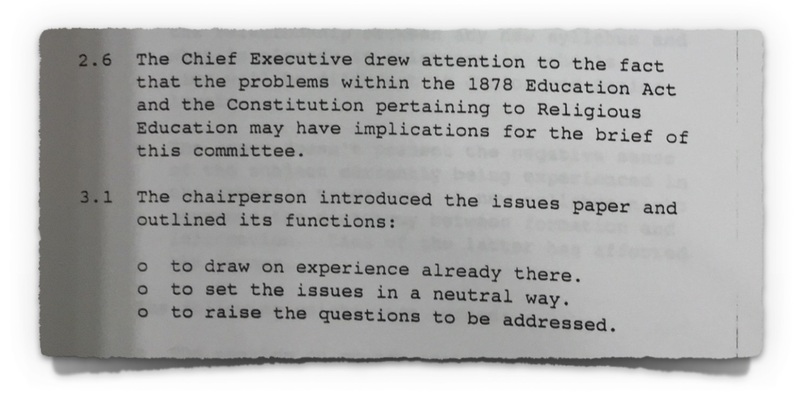 In his correspondence of 10th March 1994, Micheál Ó’Néill went on to explain to the NCCA a further constitutional requirement for religious neutrality. That is, if the Religious Education course deviates at all from neutral content, which is appropriate for citizens of all faiths and none, then it will also breach the constitutional prohibition on endowing a religious denomination. That is, if publicly funded teachers who are supposed to be teaching a neutral course about religion, are in fact engaging in religious instruction/faith formation with respect to one particular denomination, then this amounts to unconstitutional endowment of that denomination by the State. These legal issues were discussed again by the NCCA Course Committee during their meetings on 5th May 1994, 11th November 1994 and 28th November 1994. Eventually, the NCCA met with the Department of Education on 27th January 1995. The Department’s memorandum of this meeting again noted the constitutional issues and the implication of those legal issues for “the structure, format and content of the syllabus”. Specifically, the Department also linked these requirements around the content of the syllabus, to the rights of “members of non-Christian Churches or individuals/groups of no religion”. In case the need for pluralist approach to the course was not yet sufficiently clear, a delegation from the Department of the Education attended the NCCA Course Committee meeting on 30th January 1995. This delegation included Don Thornhill, Sean Gleannain and John Boland. 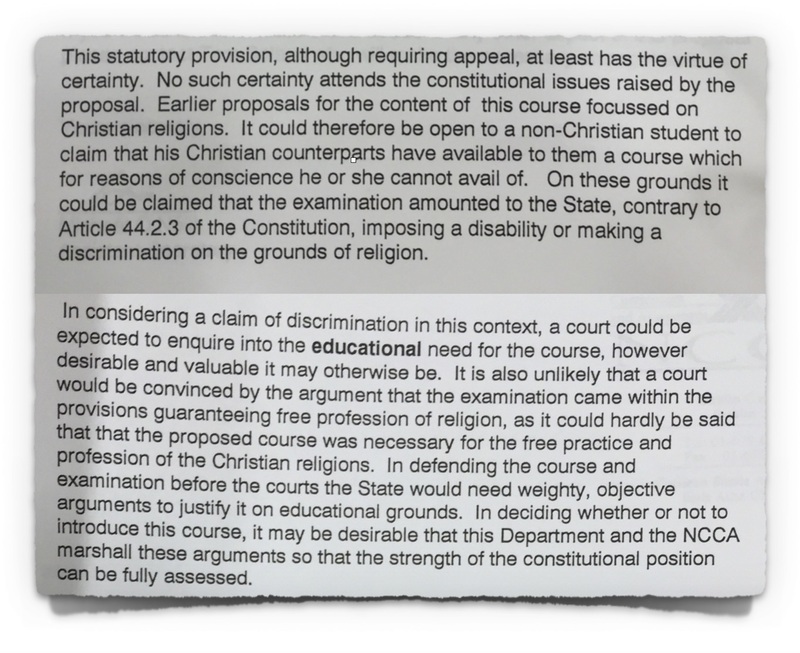 They again referred to the constitutional requirement for the course to be suitable for students of all faiths and none, as otherwise it would breach the constitutional prohibitions on religious discrimination and endowment of a religion. 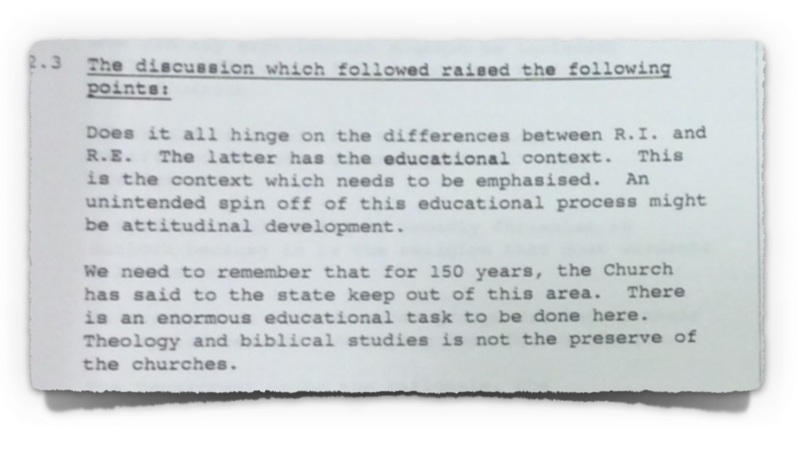 The minutes of the meeting are clear that a State Religious Education course cannot involve the Churches teaching the truth of their own doctrines to children. Rather, there is a statement that “Theology and biblical studies is not the preserve of the churches”. That is, the content of the course must be educational in teaching about these areas neutrally and it must not stray into faith formation/religious instruction with respect one or other denomination. The meeting was also clear that religious instruction/faith formation was already catered for within denominational schools as part of instruction with respect to the patron’s ethos. 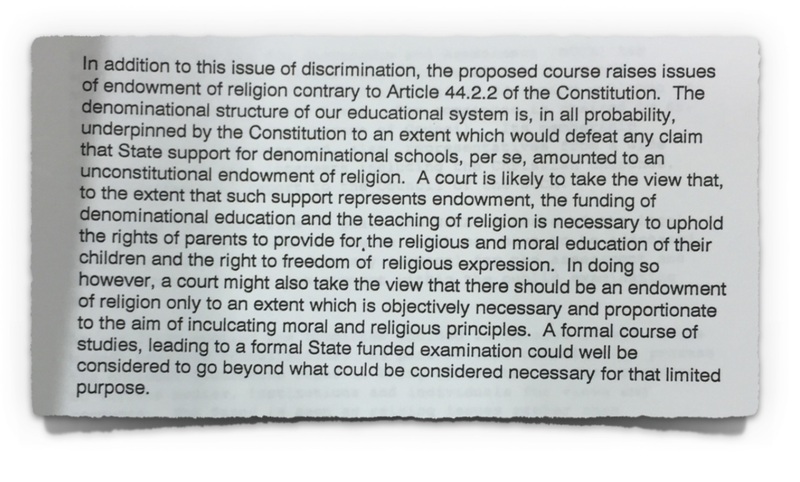 A State Religious Education course would then not preclude patrons from continuing with such religious instruction/education but it is noted that the State course must have a “broad pluralist approach”. As such, the State Religious Education curriculum cannot be compromised by the denominational interests of one faith. 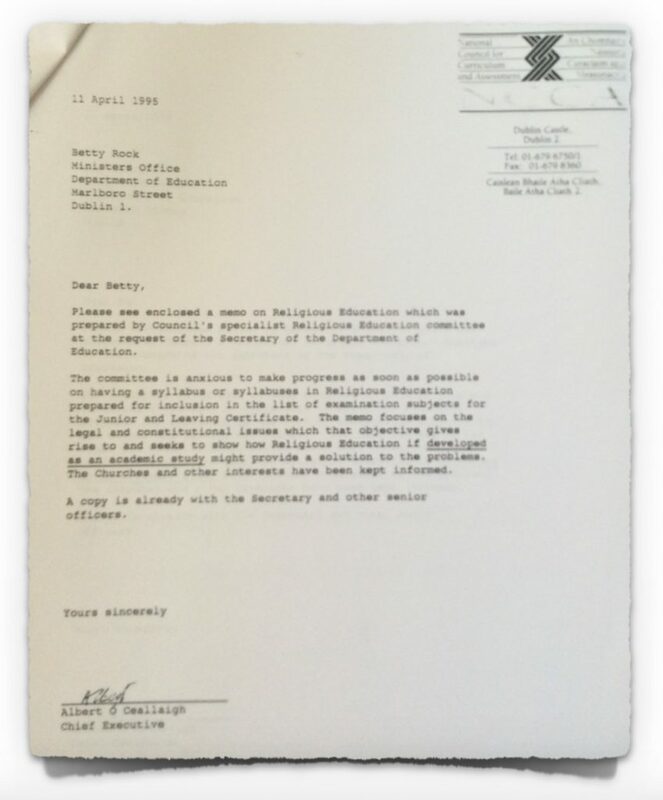 On 11th April 1995, the NCCA then wrote back to the Department of Education. The purpose of the correspondence was to accept the legal constraints that had been outlined, in terms of ensuring that the State Religious Education course must be suitable for children of all faiths and none. Specifically, the NCCA emphasises that religion is viewed as a subject for “academic study” as opposed to involving religious instruction/faith formation. This correspondence also indicated that the Churches had been informed of this situation. So there is full awareness within the Department of Education, the NCCA management, the NCCA Course Committee and all of the Churches, that the State Religious Education curriculum must be a pluralist one and suitable for all religions and none. For any content within the course to instruct children on behalf of the particular sectional or denominational interests of any one particular Church, would be a breach of two separate Articles of the Irish Constitution. Furthermore, having positioned the course in this manner and communicated to citizens that the course content is suitable for those of all faiths and none, to then allow religious instruction/faith formation to creep into the content in any way, would be a breach of the constitutional rights of both parents and children. 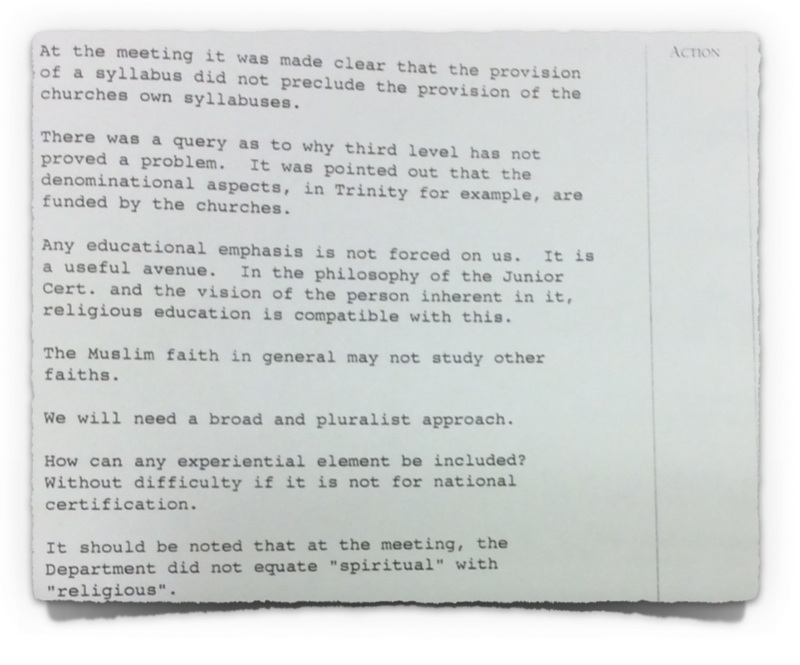 Further documents obtained by Atheist Ireland under the Freedom of Information Act, show how the NCCA engaged in bilateral discussions with the Roman Catholic Church, which resulted in breaching the precise constitutional limits that they had placed on themselves. In this manner, they are continuing to discriminate against non-Christians, with respect to the current State Religious Education course at second level. How to opt your child out of religious education classes, including sample letters to send to the school principal. There is a wider context to this Mary said yes .. Same in the UK, the main difference being that Varadkar ..
My daughter is just six and is been told about ..